Computer of the Week. The Freeman PC Museum... Largest Collection of Vintage Computers On The Web. 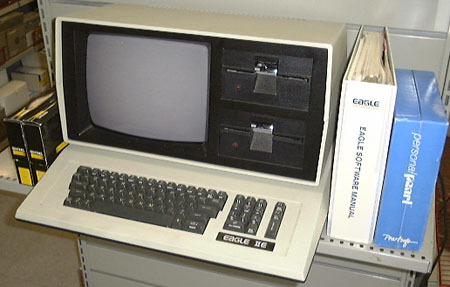 Eagle Computer was formed by using computers manufactured by Audio Visual Labs. The Eagle I and II included AV ports on the back that were replaced by RS-232 ports on the Eagle. Eagle Computer was a instant success and CEO Dennis Barnhardt took them public. On the day of the offering Dennis went out and purchased a new Ferrari and had a most unfortunate accident and was killed. The company died as well from a slow death as it never recovered from the loss of Dennis.